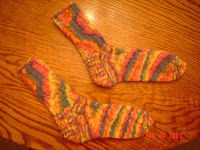 This is a pair of socks for daughter #2 -- they are multi-colored -- the photo doesn't do them justice! They are made out of Encore Colorspun in the Wide Wale pattern (I think I have this pattern down pat now!) I have now learned that I can make two pair of socks out of 3 skeins of this yarn, so I purchased an enough to make me a pair of these later on. Can you tell I like variegated yarn?